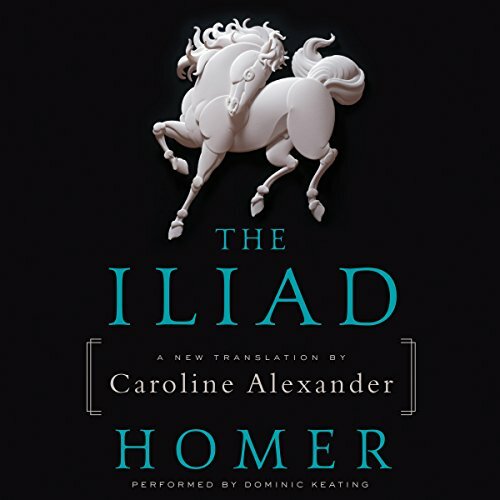 With her virtuoso translation, classicist and best-selling author Caroline Alexander brings to life Homer's timeless epic of the Trojan War. Composed around 730 BC, Homer's Iliad recounts the events of a few momentous weeks in the protracted 10-year war between the invading Achaeans, or Greeks, and the Trojans in their besieged city of Ilion. From the explosive confrontation between Achilles, the greatest warrior at Troy, and Agamemnon, the inept leader of the Greeks, through to its tragic conclusion, The Iliad explores the abiding, blighting facts of war. Soldier and civilian, victor and vanquished, hero and coward, men, women, young, old - The Iliad evokes in poignant, searing detail the fate of every life ravaged by the Trojan War. And, as told by Homer, this ancient tale of a particular Bronze Age conflict becomes a sublime and sweeping evocation of the destruction of war throughout the ages. A genuinely stellar performance by the narrator and the translator. I strongly recommend this audiobook. A translation that makes the oldest epic on the planet seem urgent. I cannot recommend this enough. I also really enjoy the narrator saying "Iliados" rather than "Iliad"--it's the little things that make a good narration. I had a hard time getting into this translation when it first came out. The language seemed unnecessarily formal, sometimes downright knotty. I kept comparing it to another line-by-line translation that came out recently, the one by Peter Green, and found greater clarity in his. What a difference a gifted narrator makes! When I listen to Dominic Keating read this translation, it sounds anything but formal and knotty: yes, it's rhythmic and filled with all the repetitive epithets so dear to Homer's heart, but boy does it have an impact. I actually listened to the Catalogue of the Ships this time around without zoning out, and could almost see the great armies massing on the plain, feeling the vibration of their boots on the ground. The words cut like sharpened bronze. It comes with a short, clear, and helpful introduction by Alexander that condenses a lot of the material she covered in her book "The War that Killed Achilles". A reliable source - the most reliable of all, Caroline Alexander herself, in an online chat - said she has no plans to do The Odyssey. It's not that doing The Iliad wore her out, it's just that she doesn't feel the same emotional connection to The Odyssey. I'm sorry to hear that. I've love to hear someone do for that poem what she's done for this one. Many people have done line-for-line translations of Homer, Richmond Lattimore being the one most often recommended. Lattimore's verse has great dignity but (for me) not nearly so much clarity, and nowhere near the visceral punch. I've read the Iliad in so many different translations that I have no idea whether this one would be good for a first-time listener. But if you have an interest in Homer, you owe it to yourself to give this one a listen at some point. After having read Why Homer Matters (by Adam Nicolson), I tasked myself to read the source material, having never read it in my formal education. I managed to get half way through a different adaptation when it became a chore to continue so I abandoned listening. Recently, I was highly recommended this translation and I'm glad I gave it another try. The introduction alone gave a succinct encapsulation of "why Homer matters". The Iliad is the source of all storytelling and this translation was incredibly fluid and the narration was completely engaging! I was swept into the drama (which I felt lacking in my last attempt) and I think I would listen to anything read by this narrator. There are reasons this work has stood for 3000 years. We all face the same fundamental human dilemmas illustrated by Achilles, friends and enemies: Life, death, the struggling for meaning...and perhaps the fickle dictates of fate. This well written and masterfully narrated version has fast become my favorite version of this epic tale. This translation and the performance together make an absolutely thrilling listen. A narration that sends a listener back to the text to enjoy it again and in another way is rare, indeed, and this production does just that. As was surely the intent of its composers, this poetic telling of the struggle of bodies and hearts and minds for the sacred city of Troy weaves together threads of myth, history, and human drama to form a living tapestry in the imagination of the listener. The narrator did a fantastic job, restraining himself from poetic flourishes or "acting," but kept his pace and cadence appropriately throughout, never straining for effect. I can appreciate the academic pleasure of this translation. I find the reading excessively annoying. I'm sure there are better versions of The Iliad! gory details of the war are given more importance then the actual story line. Narration did not hold my attention as much as The Odyssey by Ian McKellan. Disappointing!